Is an empty saddle okay? This is the ending of a boot race Mom. To race, the participants must surrender their boots to be scattered at the end of the arena. The contestants must race a mule to the end of the arena, dismount, find and put on THEIR boots (this rule was particularly emphasized), remount their mule and make it back across the finish line. This is how most mules finished the race. 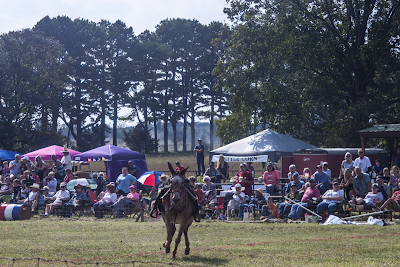 Did you know that mules are pretty grouchy animals?